Model USB-Bay2 USB Expansion Module - Custom Sensors, Inc. The USB Bay 2 is an intelligent, stackable expansion module that connects to a PC or Server via the USB port, providing one high-speed RS-232 serial port, one printer port, two PS/2 ports and two downstream USB ports. The unit features easy connectivity for traditional serial, printer, PS/2 and other devices. The USB Bay2 is used to add traditional ports missing on the newer PCs and laptops. 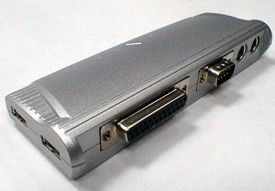 In addition to the conventional Printer, Serial, Keyboard and Mouse ports, the units provides two additional USB ports. The unit can be powered from the computer's USB Port, or from an external power supply (included). Using the power supply increases the allowable current draw from the two USB ports. Dimensions:             3.25" X 2.125" X 1"